The Vuze is an 8 lens 360 camera that can also shoot in 3D. The combination of 360 and 3D video can be powerful, giving the viewer a far more immersive experience than each individual format can provide alone. The Vuze aims to bring features usually found in pro level cameras to the consumer, however it still charges a premium for this privalage. The Vuze is one of the most expensive consumer 360 cameras available right now, but it is also alone on offering 3D 360 video. Is this feature worth the extra expense? 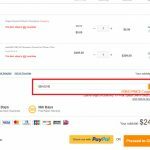 I tested the Vuze to find out. 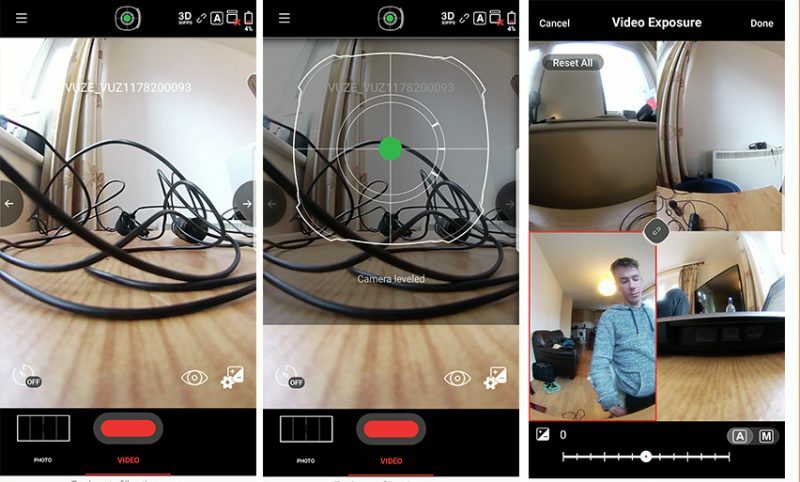 In January 2018 Vuze released a large software update which added new features, the test for this review took place after the software update and therefore takes them into account. Does 3D make a difference? Controls Single button control on camera. Remote control with smartphone app. The Vuze is not a small camera. The flying saucer shaped device is fitted with 8 individual lenses and a rather large bettery. The plus side is that the Vuze can shoot for an impressively long time, however it also makes the camera one of the bulkiest and heaviest I’ve used. The Vuze was never designed to be a hand held camera anyway, it’s meant to be attached to a tripod and left to do its thing, in which case the weight and size doesn’t matter too much. Again, I must stress that this isn’t a camera that you are going to attach to your selfie stick and walk around with. The Vuze has just a few manual controls on the body, with the majority of the controls saved for the app. You’ll find a power button and a shutter key on the top of the Vuze and a charging port/microSD slot hidden behind a door between two sets of lenses. The camera has excellent build quality and doesn’t feel cheap. Its size and weight give it a premium quality and it feels like it’s more capable than its smaller rivals. The 8 lenses are evenly distribute dinto 4 sets of two, which is how it’s capable of shooting 3D as well as 360. With so many lenses, the Vuze is a unique looking device and unique in its product category; it has more lenses than any other consumer 360 camera under $800. Does quantity = quality? Let’s find out! Before we take a look at some video, I should let you know that the 3D aspect of the Vuze is best experienced when viewed on a VR headset. In fact, it’s rather pointless to watch a 360 video in 3D without one. So while the following video tests were shot in 3D, most of you probably won’t be getting the full effect if you are not watching using a headset. I shot some fairly extensive tests with the Vuze in a variety of lighting conditions and environments. The Vuze is very easy to set up and start shooting with and I only experienced one freeze which was fixed by restarting the camera. 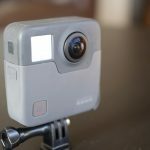 When watching on YouTube I would rate the video quality as “good” and on par with other 4K 360 cameras like the Ricoh Theta V and Insta360 One, however this camera is more expensive than either of those. The Vuze is great at picking up color and detail, but not as great at dealing with direct light. The biggest issue I have is that the stitching lines are quite obvious if an object (such as a person walking past) intersects them, and as there are 4 sets of lenses working together, there are 4 stitching lines. A recent software update allows you to adjust the stitching which does offer some improvement, however I would say that the stitching is not as accurate as some other cameras, probably due to the increased number of lenses. I compared the video quality of the Vuze with three other 360 cameras that can shoot in 4K, let’s see how it measures up. This 4 way 360 camera comparison is pretty useful for seeing the differences in video quality between the top 360 cameras, even though they all shoot in 4K. 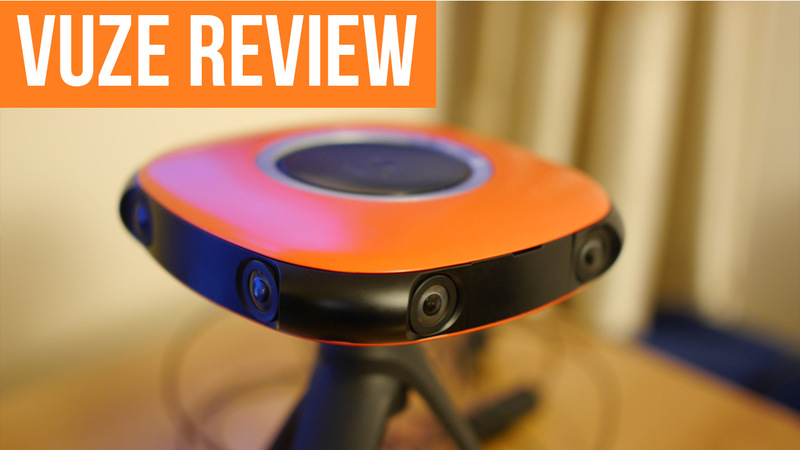 The Vuze performed reasonably well in most comparisons; it was certainly better than the much cheaper Insta360 One and in most tests it was either the best or second best. The Vuze struggles with bright lights, often over exposing. What I will say, and this is true for any 360 camera, is that the quality of the 360 video on YouTube is noticeably different from the quality of the video when played directly from the file. This is because YouTube compresses the file massively. If you are viewing the test video on a VR headset, be sure to select the 3D option and you’ll immediately see a difference. I have viewed the tests on a headset and I can tell you that the difference between non 3D and 3D is noticeable. 3D gives the video depth, which in VR terms is hugely important for immersion. This is a entry level 3D camera though, so while you will see a difference (and it does look quite cool), don’t expect to be transported to an alternate reality. The main issue is that 4K 360 video when viewed on a VR headset still looks kind of blurry and pixilated, no matter which camera you use. It largely depends on the headset you use too, if you use a higher end headset then the video will look better, but a cheaper Gear VR or Google Cardboard won’t give you the same experience. Overall I’m impressed with the innovation behind the 3D 360 video, and the video quality itself is pretty good. It must be said that you can get similar quality 360 video – sans 3D – in more than a few cheaper cameras. 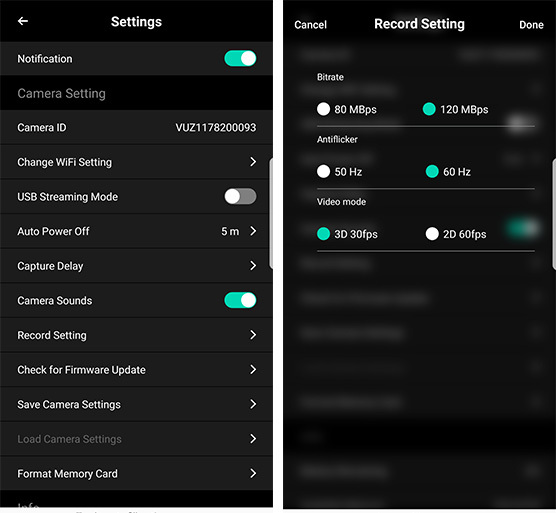 The Vuze app can be downloaded from the Apple App store or Google Play store, and is required to access the full settings available to the camera. Connecting wirelessly is very simple and takes a few seconds. Once connected you’ll see a preview screen from one set of lenses as well as your current settings. You can’t preview the full 360 image on the app, you can only preview the image from each set of two lenses. It’s a shame that you can see the full 360 preview as this is useful for positioning the camera correctly. The app offers an alternative in the form of a tilt detector which will inform you if the camera is not level, and if so, how to correct it. You can change several settings and adjust exposure manually. One very useful feature is the ability to adjust exposure for each pair of lenses individually, which can help even out particularly dark or light areas of your image. I don’t know of any other consumer 360 camera that allows you to do this. The app is very stable and has not crashed on me once, however it runs noticeably faster when the preview is disabled, so you may want to do so until you need to use it. 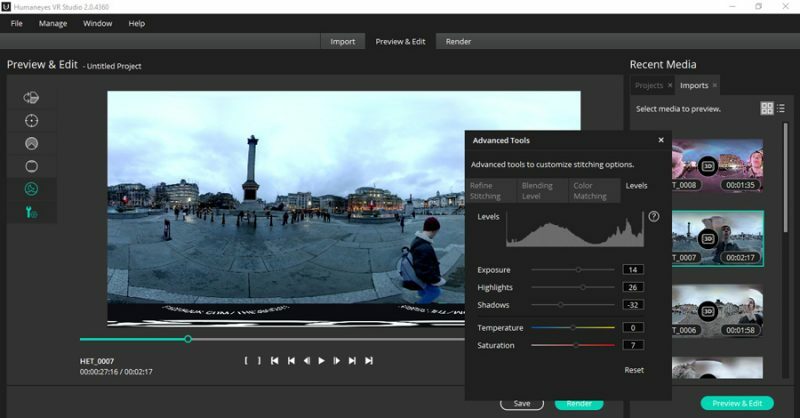 The HumanEyes Studio is the desktop based software that allows you to stitch and edit your 360 video before rendering it. Most companies that sell 360 cameras provide desktop software, but some are pretty pointless. The HumanEyes studio is thankfully a very useful tool for editing your Vuze footage and can make the difference between average and great video. The VR Studio is primarily used for stitching your footage so that it’s ready to be watched in 360, or uploaded to Facebook/YouTube. Prior to doing this, you can edit your video in several ways. The VR studio allows you to adjust color, exposure, saturation, shadows and highlights, which basically allows you to completely change the look of yor video. 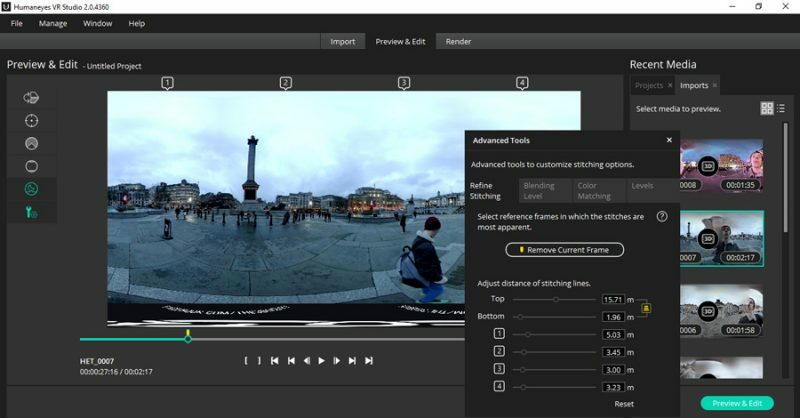 The VR Studio makes this a very easy and intuitive process, and is specifically designed to work with 360 video, unlike other editing programs like Premiere Pro. The Studio also allows you to adjust stitching, which is a slightly more tricky process that I’ve not really got the hang of yet. Theoretically you should be able to largely eliminate any stitching errors between the 4 sets of lenses, however I’ve only able to see minor improvements. 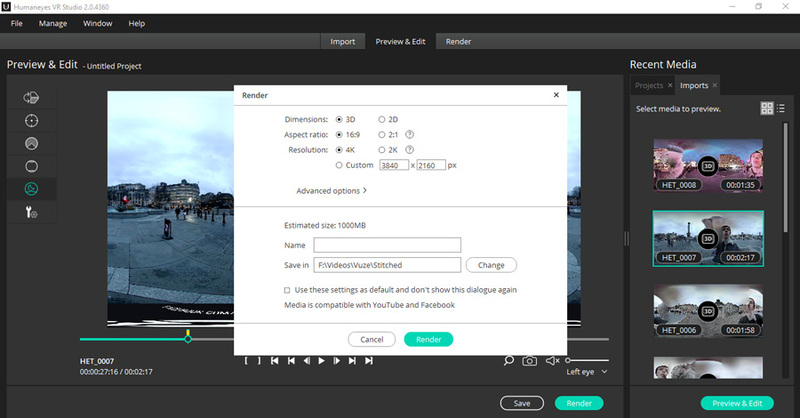 Lastly, the VR Studio allows you to choose render settings which can greatly impact the final look of your video. For a start you can select to render in 2D or 3D, you can alter the bit rate or select adaptive stitching (currently doesn’t work on Windows desktops). One feature missing from the desktop program is the ability to combine multiple videos. If this was possible in the VR Studio then you wouldn’t need to use any other editing programs, but as it is you’ll probably also need Premiere Pro or Vegas Pro if you want to combine multiple clips. Considering that this is a free program, it’s remarkably useful and powerful for quick improvements to your Vuze video. 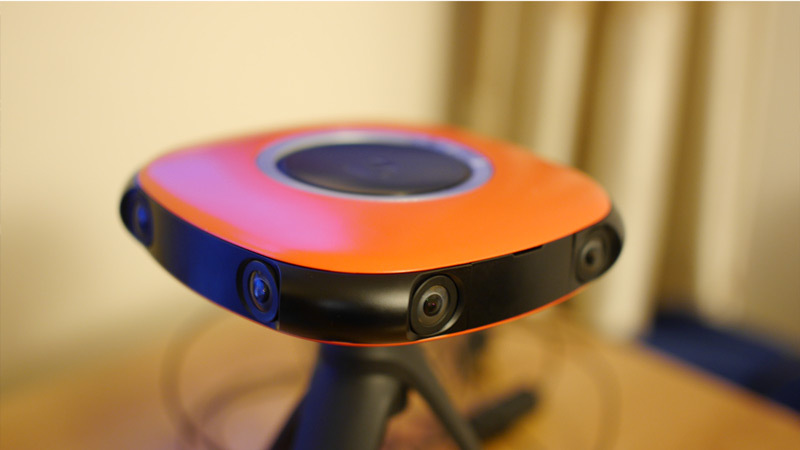 The Vuze has four microphone embedded in its body that allows it to record directional sound, which is key for immersion. The sound isn’t amazing, but it’s better than most other 360 cameras and 4 mics is always better than one. The Vuze oddly doesn’t employ fully omnidirectional audio, which it should be capable of given the 4 microphones. The Vuze is a first generation device and it shows, there are a few issues to be resolved and the end result isn’t perfect, however there is no denying that 3D and 360 is a great combo. The Vuze is the only consumer 360 camera that marries the two formats and is therefore probably the best 4K 360 camera for shooting video specifically for a VR headset. It gets most of the important stuff right, 4K video looks great and the 3D effect is noticeable. My primary gripe with the Vuze is how it handles stitching, which becomes very obvious when moving. This can be improved with Firmware updates and I hope HumanEyes continues to work on it. If you are not interested in 3D then forget about the Vuze, there are cheaper cameras out there. 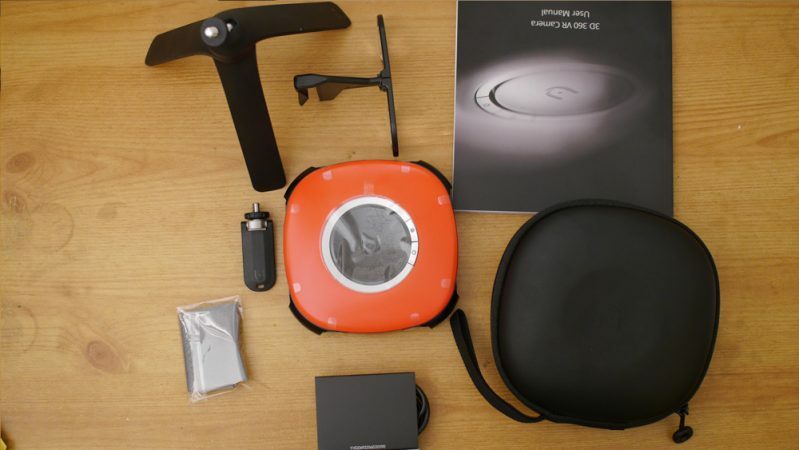 If 3D 360 sounds interesting to you, then this is pretty much your only option for under $1000.